I'm back at work and feeling distinctly convalescent! not up to tackling a large canvas - but twitching to do something. so I sketched thisfeather, which was a present from this little tiger - who has eyes for the pigeons but isn't capable of catching one - so she brings any feathers she finds into the house to play with. Hence its rather raggedy state. 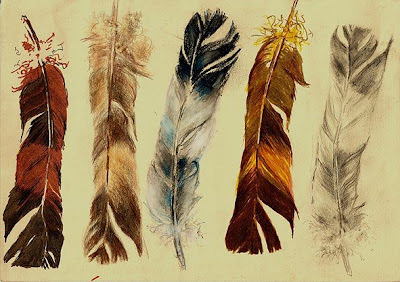 I simply had a play with various materials, looking at the feather again and again in pastel pencil, 2B pencil, Pitt brush pen and coloured pencil. With the brush pens and coloured pencil I just decided on an equivalent tonal value of pen for the various greys and blacks of the original and substituted a warm amber/honey for the lightest parts and deeper umbers for the blacks with no attempt to use the original colours. She's looking to produce something with a whole lot of different peoples 'day' and could possibly contact some of you in the future for permission to use your work. I can't say too much about her plans but it involves potential prestigious exposure - she hadn't explained this at the meeting - simply asked us to have a go and send her the results - but has now gone into more detail. So .... if you want your work to be considered you need to stick to the brief (if you want to do it purely for fun and not stick to it, that's fine) Her rectangles are 10cm wide x 6cm deep and the sequence needs to be of 12 of these in the format of my original 'my day' post. Cool Day, Warm Evening Light Across the Bay. 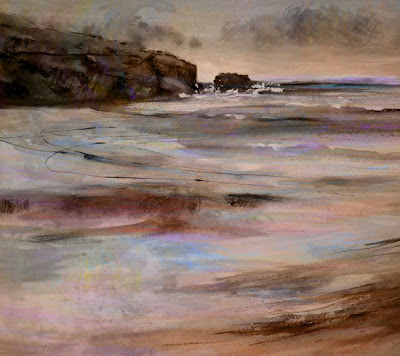 Vivien Blackburn - digital experiment I'm at last on the mend :>) but didn't feel up to painting yet - so I thought I'd work through some ideas in Photoshop, looking at different lights across the beach. I really like the subtle muted colours in these and will certainly do some work in paint or pastel from them - I'm feeling they would work very well with a loose acrylic or watercolour underpainting finished with Unison pastels. What do you think? Red Pools, Evening Light Across the Bay. 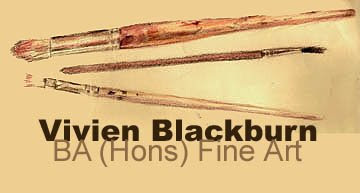 Vivien Blackburn. Digital Experimentor the heightened Expressionist colour of this one? this would be fun to play with as well. 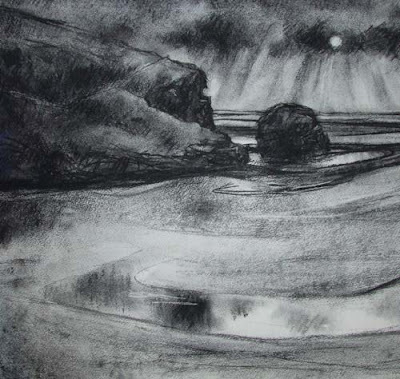 or this one with the cliff under a cloud apart from a flash of light catching the top and the front of the beach? apologies for not posting much this week but I've been laid low by a truly vicious killer bug - I'm hoping desperately I'm on the mend now. In the meantime there have been som great responses to the My Day and Paintbrushes challenges - I'm really enjoying seeing all this lovely work and I'm going to have to call in a panel to choose the winner in the paintbrushes as there are such great contenders. The panel don't yet know they are to be called on! You've got until the end of May if you haven't yet had a go. Just post your links in the comments section and I'll add them to the post below for everyone to see. Please check out the new additions at http://vivienb.blogspot.com/search/label/challenge they are well worth a look. I've been really ill since Saturday (you don't want to know the icky details) so I've only just managed to pick up your emails and comments and links to the brushes and my day challenges. What a great surprise - several fun new ones to add - so don't forget to check back on the 'challenge' tag to see new additions - I add them as they arrive. Below is my friend Glen's version - she and her husband have a fishmongers (very good one too) and she has an incredibly busy life delivering to businesses like hotels and homes and working in the shop, visiting her elderly mum and finally managing a little bit of time to paint, often late at night. She doesn't have the time for a blog. This is a challenge for those who would like to take it up - with a prize for the work I like best. I went to an artists talk by illustrator Liz Minichiello on Thursday, which was interesting. After the talk about her work she gave out A2 sheets of paper with rectangles printed and asked us if we would do sketches of our day, with detail and tone, and email/post them to her. 12 rectangles, each about 4 x 2.5 ins. 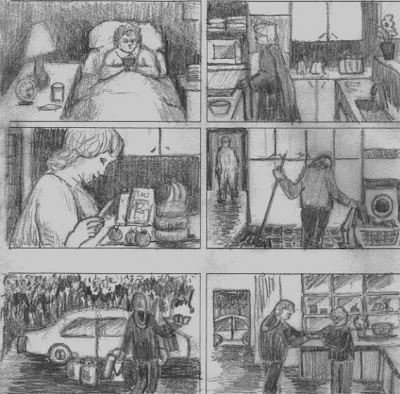 The brief was to do this from memory rather than observation. one cat wants to pursue his hobby of ornithology NOW! the other says her throat has been cut and noone has fed her for a week - hmmmm - see her shape! Drive to work, nice, watch the sky and the light of the early morning on the fields. front and back cover of the book - Seascapes: Vivien BlackburnMy book arrived today! I'm very happy with it apart from a couple of small silly errors that I'd made - very minor ones like forgetting to change the font on the back page so it doesn't match the title page. So once I've put them right I'll make it available for those who have emailed to say they would like to buy a copy. I can definitely recommend blurb. The one thing I don't particularly like is the payment system - a bit like imagekind, where they don't pay out until a certain sum is reached. Blurb are fairer though, they pay monthly (for anyone interested) but don't pay until the money owed to the author is over £12.50 and they charge a £3 admin fee for sending it. That's £3 for sending payment for 1 book sold or 100. The colours are true and the quality and binding is good. This is an old piece of work that I have on the wall in the bathroom - a monotype I did in the first year of my degree. It is actually a normal rectangle but as it's behind glass I had to take the photograph at an angle because of the reflections. it was made by rolling out a varied mix of turquoise printing ink onto a metal plate and printing it onto the paper using an etching press (rather like an old mangle with a flat bed but rather more expensive :>( ) - inking up the whole plate with a thin layer. 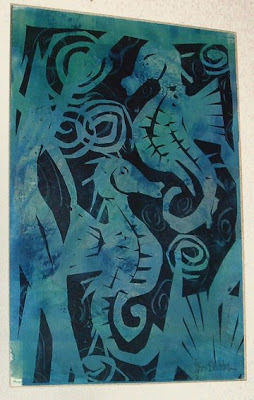 It was left to dry overnight and then I made stencils, cutting and tearing newsprint freehand with no drawing to make the sea horses and weed. These were positioned on the turquoise print. I've been away for the weekend, visiting my youngest daughter and collecting some work from a gallery. woohooo!!! well I finished and ordered it today so I can't wait to see it - and the mistakes I've no doubt made! I hope it's ok - it ran to 38 pages in the end. I used the second cover and as this one is just the prototype for me I stuck with the subheading of 'or I must go down to the sea again' with a subheading on the title page of 'plein air and studio paintings of the coastline' as the descriptive subheading for google. blurb's programme crashed and lost my first version - well it's still there but it won't let me get to it :>( - the second version looked better though and I was a much faster doing it. All this feedback is really helpful - so please, let me know which cover design you preer and why? Casey pointed out that black may show finger marks, a good point - I like it though so I'll risk it! I'll know when I see the proof whether it will work long term.